For this recording I have chosen five striking works that show how the harp can evoke radically different atmospheres and be a means of expression for composers writing in highly diverse styles. The centrepiece of the album is R.M. Schafer’s highly original The Crown of Ariadne, based on events in the life of the Minoan Princess, Ariadne, who saved Theseus in his struggle against the Minotaur of Knossos on the Greek island of Crete. The harp is set amongst an array of small percussion instruments – bells, cymbals, crotales, a bell tree, triangles and wood blocks – all played by the harpist. I remember the first time I heard Ariadne, ten years ago, performed by Erika Waardenburg. I was mesmerised as she swept between the instruments on her left and right, deftly playing the harp all the while I knew I had to perform the piece myself, so I bought the score immediately! However, it wasn’t until 2010 that I had the opportunity to devote my time to learning the music, when I was honoured with a Wingate Scholarship. The financial award enabled me not only to purchase the required percussion instruments, but also allowed me the luxury of studying the work intensively with Erika Waardenburg in the Netherlands. As the Crown of Ariadne is the Northern Crown star constellation, I see the other pieces on this album as other stars, illuminating all the colours, emotions and virtuosity of the harp as a solo instrument. Mayuzumi‘s Rokudan, like Ariadne, uses percussive effects on the harp to draw us into the soundworld of the Japanese koto. Eleanor Turner is a musician of exceptional skill, recognized internationally for the warmth and passion she gives to her performances. 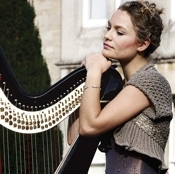 In the 2007 Cardiff European Harp Competition she won First Prize – a magnificent Salvi concert harp – an achievement that led to numerous recitals in concert halls and festivals across Europe. Eleanor also won Third Prize and the Peutz Audience Award at the Netherlands International Harp Competition 2010 and Second Prize in the Gaudeamus Interpreters Competition for contemporary music, held in Amsterdam in 2011. 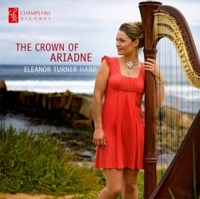 Eleanor started playing the harp aged five and made her London concerto debut at the Queen Elizabeth Hall when she was fifteen, with the Academy of St. Martin in the Fields, conducted by Daniel Harding. This inspired her to pursue a career as a concert harpist; commissioning, performing and composing new music to showcase her instrument. Eleanor has been awarded funds by The Tillett Trust and the PRS Foundation for New Music, the Musicians Benevolent Fund for a groundbreaking project with hip hop dancer Lizzie Gough and a Wingate Scholarship to study contemporary harp repertoire, which led to this recording. Teaching is an important part of Eleanor’s life and she enjoys passing on the wealth of knowledge that she gained from her excellent tutors, principally Daphne Boden at the Royal College of Music Junior Department and Alison Nicholls. Eleanor has also studied with eminent harpists Catherine Michel, Erika Waardenburg, Ernestine Stoop, Helen Sharp and Hugh Webb.